It was a G161 dissy. Engine is on the floor now with the gearbox bolted up. The twin cam is sitting in the wagon. - fuel line 20mm too short. The kicker was when I when to feed the clutch cable through the mounting on the engine brace only to find it blocked by the engine adaptor plate. Other than that the engine fit like a glove, even my modified front left engine mount. The rear mounting on the gearbox lined up perfectly - like that never happens. Exhaust clearance spot on. I ran out of time on the weekend but I only have the starter wire to re route to the left side, radiator and heater hoses and a final check to do including initial carb settings. Pluse remove rigth engine bracket and trim back adaptor plate of course. Idle is a touch ragged but other than that it runs really smoothly. Not going to play with idle too much more until after I fit the electronic ignition. I must have the main jets very close to right because the response is quite chrisp. the 55 idles might be a bit on the rich side. I have a bit of an oil leak to fix in the timing cover. The water pump was leaking water slowly through the shaft seal - but it stopped? Gearbox rebuild also quiet and smooth. 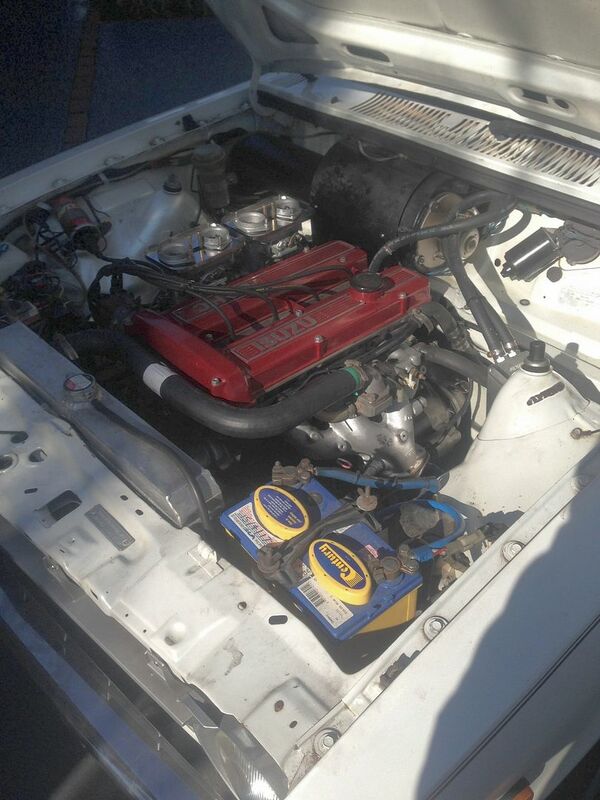 Whats the upper rad hose, V6 Commodore? Ended up going richer on the idle jets to 60's and could probably go to 62s. Carbies were not very happy when the engine was cold and were spitting a lot. The 60's helped and the warmer weather has eliminated the issue. The oil leak was around the timing chain cover. When the block was decked the cover was not fitter and planed to the same level. Consequently the gasket between the head and the cover was two thick so I used a sealant instead (as in poor quality sealant). The crankcase pressure must be pretty high because the oil poured out. The fix was to pack with join with very expensive form a gasket sealant and fit a stainless steel hose clip (plumbing fitting / Bunnings) over the gap to hold the sealant in place. The clip was trimmed to match obstructions and snibbed up tight when the sealant hardened. Worked a treat (so far). So the lesson - if you get a block decked, fit the timing cover.